Daniele De Santis shot him before the 2014 Italian Cup final. 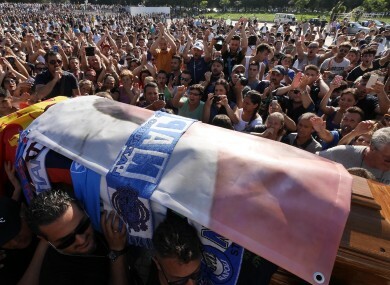 AN ITALIAN JUDGE has handed one of the the country’s most notorious football hooligans a 26-year prison sentence over the fatal shooting of a rival fan before the 2014 Italian Cup final. Daniele De Santis, a Roma “ultra”, was convicted of shooting Ciro Esposito during clashes with Napoli fans who were in Rome for their club’s Coppa Italia final against Fiorentina. Esposito died from his injuries 53 days later. Lawyers for De Santis unsuccessfully argued that he had acted in self-defence. Their client was also ordered to pay damages to the Esposito family. “I forgave Daniele the day after the clashes. I never felt any hate towards him, I only asked for justice,” Esposito’s mother, Antonella Leardi told reporters after the verdict. The judge also sentenced two Napoli fans involved in the violence in the Tor di Quinto suburb of Rome to eight months in prison, significantly less than the three years prosecutors had requested. Ultras are gangs of fans who pride themselves on their dedication and loyalty to their clubs and are frequently associated with the violence that continues to blight Italian football. Email “Notorious football hooligan given 26 years in prison for shooting rival fan”. Feedback on “Notorious football hooligan given 26 years in prison for shooting rival fan”.